This project has been very special to work with from the beginning. I can only describe it as the golden section between doing a personal project and creating work for a corporate client; which is, in our trade, a rare pleasure. The concept was very simple, but highly unusual for a brand such as Volvo Trucks. The Volvo FH is the flagship of Volvo Trucks and the kick-off of the Volvo Ocean Race was coinciding with the loom of the twentieth year anniversary of the legendary model. So, the only thing we had to do, was to get the iconic model out of the cold waters of the Swedish west coast. I worked elaborately on the conceptual approach, set the tonality of the film, collaborated with a music composer on creating an original theme to go with the 1 minute commercial. 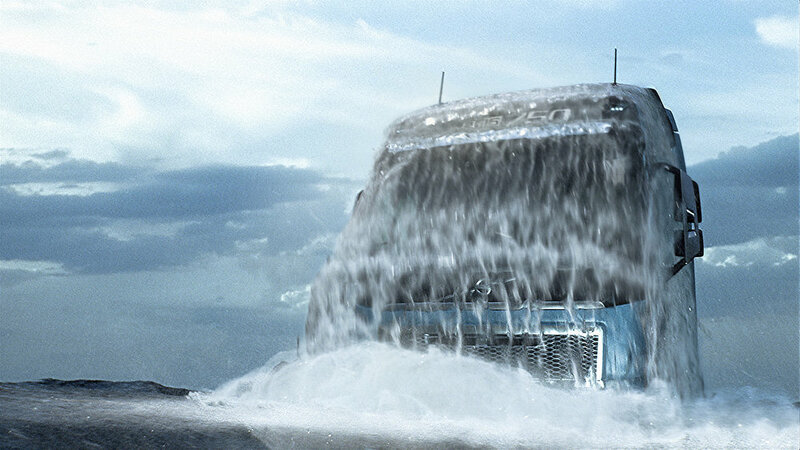 I storyboarded the scenes, and worked closely with Filmgate in executing the elaborate CGI shots with the product in full focus, employing the use of high level water simulation graphics. In parallel, I worked with delivering a digital strategy, introducing a teaser, and planning for the roll-out of the film in 11 languages. I also repurposed the footage to create an array of theme-specific bumper ads. It was pleasant to see that the film was received with applause from the target audience, amassing a wide array of delightful reactions. It was also covered from several advertising magazines and was featured in the Ads Of The World, and the Drum: Creative Works Leaderboard. The brief request was to create a campaign in order to promote the new Volvo Trucks Merchandise Collection. On the creative side, I decided to bid on an emotional journey that cherishes the image of the driving profession. Driver Life is good and bad; many lonely hours on the road but also the time to think, dream and reflect. The task at hand provided the opportunity for the brand to instill likeness and proximity to the most fundamental interest group and users of the products, the drivers themselves. I aimed to build a world around the drivers, using subtle nostalgic references from the 80's, with undertones of retro elements, while leaving the trucks and the merchandise as discreet props in their universe. The aspiration was to create stories that could resonate and connect with this ample and diverse target group. We selected two real life Volvo Trucks drivers that would represent the target audience best, and built the campaign around them. On the strategic side, I designed an ecosystem with various devices (online and offline channels, SoMe, corporate sites implementation and web experience) that would use a campaign site / embedded into the web store as a central hub, where one can see all seven films, meet the drivers and shop the products. The production took place in Bergen-Norway and Berlin-Germany, in the hometowns of the drivers. The resulting material was used to produce a wide array of deliverables, including the site, YouTube films, SoMe material, banners, a premium brochure, offline POS, etc. Arctic Paper, one of the leading sellers of high quality design paper in the Nordic countries, assigned us to promote their yearly Munken Paper Range publication. Their latest edition consists of a series of 6 books and carries the theme “Paper is for real”; a journey that explores how our perception works and what triggers our senses. Looking into the core target audience, creatives and printmakers who use high quality paper in their work, a different method was called for. Since the most trivial way of promoting paper is through spam sampling, we came up with the idea of stimulating a different scent: Sound. In the creative business, most ADs, printmakers, and the rest of the core demographic, are plugged into their music playlists most of the day while working. So, in order to increase awareness around Munken paper, we decided to create a playlist for them, consisting of 7 tracks of "Munken Paper Sounds". We used ASMR technique to record of paper in different states and introduced ambient rhythms and natural sounds to tie the mix together. Every track has a different theme associated with a different brand of paper. We worked with Kaliberljud to produce the high quality tracks. We used SoundCloud as a social platform to channel and spread the experience. We created a separate page on Arctic Paper's website to facilitate the ordering process. The campaign generated several thousands of listens on Soundcoud, spread across social media as an "Innovative out-of the box campaign" and was mentioned by Resume.se. As a follow-up, we came up with the first ever promo sample paper kit that exceeds the mundane approach of a paper catalogue, and helped the brand transcend the one-dimensional physical approach, … through sound. BeyondZero is SKF‘s portfolio specifically designed to reduce environmental impact. SKF asked us to create the communication for their product presentation at the 2013 Hannover Fair. We decided to make a film that would explain the idea of their new product portfolio in a very understandable and pleasant way, design the trade show display booth and provide signage design. The challenge was to reduce the highly technical aspect of the product and elevate the brand to a more emotional, humanistic and “larger than life” class of communication. My task as an Art Director was to set the Look and Feel of the film, design the booth, oversee theMotion Graphics and the Sound Production, create functioning key framing, storyboards and mood boards and provide illustrations and visual assets where needed. Moreover, I had to safeguard that the result would be in line with SKF‘s highest quality standards and brand guidelines.